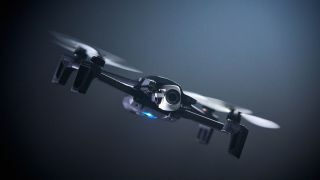 Parrot Anafi is the latest 4K drone to take to the skies, sporting a foldable form factor that's become popular among the best drones so it's easier for fliers to take their gadget with them wherever they go. The new Parrot drone clearly has its sights set directly on the DJI Mavic Air, another 4K drone that folds up for easy transport. Anafi has some impressive specs, despite its compact size at 0.7 pounds (320g). The drone features a 4K HDR camera with 2.8X lossless zoom, so you can hone in on whatever you're filming from high in the sky. The Parrot Anafi camera has another trick up its sleeve in the form of a gimbal, which tilts the sensor 180-degrees vertically. It does hang its hat on 3-axis stabilization, through the gimbal, a wide-angle lens and some software tucked inside. For a closer look at the Parrot Anafi 4K drone, check out the gallery below! Parrot claims the Anafi has a flight time of 25 minutes, impressive in the world of drones where most fliers are grounded after less than 20 minutes or so. However, we'll have to see if Anafi's flight time is as good in practice as it is on paper. What the Parrot Anafi has going for it battery-wise is that it can connect to USB-C ports, letting it charge up on literally anything that supports a Type-C connection. Anafi's flight time does beat DJI Mavic Air's claimed airtime of 21 minutes, though in our testing we found one Air battery lasted about 18 minutes. It's kind of gross, but Parrot says it was inspired by the anatomical design of insects when it created the Anafi. The result is a "half robot, half insect" drone with a durable structure that protects all the important components while remaining lightweight and compact. Hey, whatever gets the job done, right? You'll have to ask an entomologist about the top speed of bugs, but the Anaif can hit speeds of 33mph (55km/h). It's also a quiet flier, says Parrot, which is a good thing in a world where drone noise is infuriating people. Parrot Anafi is available for pre-order today at Amazon, Parrot and other retailers and will be in stock starting July 1. The drone's price is $699 / £649, less than the DJI Mavic Air price of $799 (£769, AU$1,299). Stay tuned for our hands on review of the Parrot Anafi! In the meantime, check out our DJI Mavic Air review!